Vidas and Johnson sparred over a variety of city issues such as the soda tax, the city tax abatement and term limits. Incumbent Kenyatta Johnson and challenger Lauren Vidas are facing off in this May’s Democratic primary for Philadelphia’s second councilmanic district. 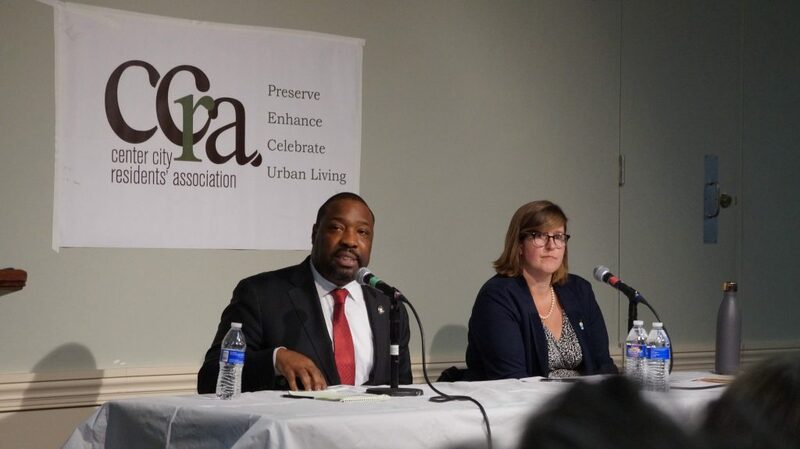 Candidates for Philadelphia’s 2nd Councilmanic District primary election Lauren Vidas and incumbent Kenyatta Johnson took to the Tenth Presbyerian Church on Spruce Street in Center City Wednesday evening for a debate hosted by the Center City Residents Association. The debate was moderated by former CCRA president Jeff Braff. At the debate, both Vidas and Johnson sparred over a variety of city issues such as the soda tax, the city tax abatement and term limits. There was no opportunity for either candidate to offer rebuttals, so the debate event functioned essentially as a forum rather than a debate. Questions from the audience were also submitted via notecards to Brown, who picked several throughout the event to ask the candidates. Despite being opposed to the tax prior to its implementation in part due to its regressive nature, Vidas said that she would not vote to repeal it. Johnson, who is a vigorous supporter of the tax, also said he would not vote to repeal the tax. Both Vidas and Johnson agreed that the tax abatement program needs to be reformed. “I have long-term residents who feel like the tax incentive is immoral because as you see development taking place in areas such as Point Breeze and [as] the neighborhood [gentrifies], people feel that it’s unfair that new residents get a 10-year tax abatement and the development is on their backs,” Johnson said. He would support a bill introduced by Helen Gym that makes sure proceeds from reforming the tax abatement would go toward the School District of Philadelphia. Alternatively, Johnson talked about raising wages for working-class people and his experience taking on American Airlines to make sure the company’s workers at Philadelphia International Airport receive $15 an hour while working. One of a handful of topics the candidates had a stark disagreement on was term limits. Johnson, who’s currently running for his third term, said he was against term limits and would not support a bill that would create a ballot question asking whether the Home Rule Charter should be amended to provide that Council members shall not be eligible to serve for more than three terms in office. Vidas, who responded after Johnson, offered her dissent. Toward the end of the debate, Brown selected an audience question that asked about the candidates’ opinions on the pros and cons of councilmanic prerogative and whether they were for or against it. Vidas slammed the concept, which she believes creates a “pay-to-play” culture. Vidas proposed restricting donations from developers to district Council people as a solution to the problem. “We have similar restrictions in contracting, but for some reason we don’t have these same restrictions when it comes to land sales and that’s just got to stop,” she said. Johnson said he was supportive of councilmanic prerogative because it allows for increased community input. He cited examples in Bella Vista and Eastwick in which the community revolted against projects proposed by developers and were ultimately killed. Additionally, he took exception to Vidas’s “pay to play” comment. “I just honestly think it’s insulting when people think that just because a person donates to your campaign, there’s always going to be some type of quid-pro-quo,” he said. The Philadelphia municipal primary is May 21.